Well this is embarrassing. It seems like I’ve written nothing apart from dinners at Pike & Pine, and here we are again with another. The summer break plus a break of another kind has put paid to my reviewing for a while, but here I find myself again, propped up at the marble pass. And it’s not a bad place to get back into the swing of things, that’s for sure. 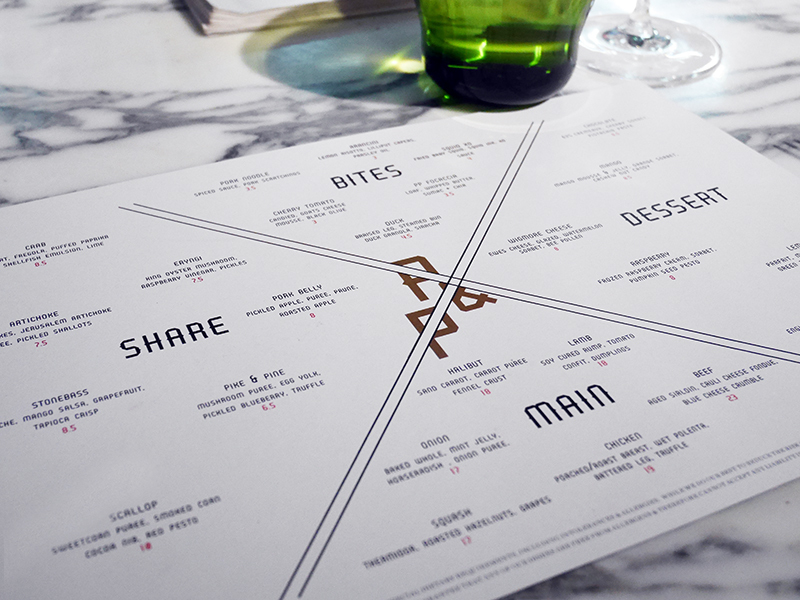 Where change seems to be the order of the day, Pike & Pine have reworked their menu, bravely in some ways, replacing their taster menus with something altogether more flexible. They certainly don’t seem to be ones for bucking the trend and where everywhere else seems hell bent on the formality of tasters, Pike & Pine are relaxing their vibe. Good news for people who were previously prohibited from a visit due to high cost, but this also opens up the restaurant to non-celebratory dinners. Not many people around these parts can be dropping £££s on meals for no cause, let’s face it. The new format is smart - bites, sharing plates, mains and desserts are laid out for a pick and mix approach so you can come in for cocktails and a few sharing plates, a main and dessert dinner or splurge on banquet of plates from across the menu. 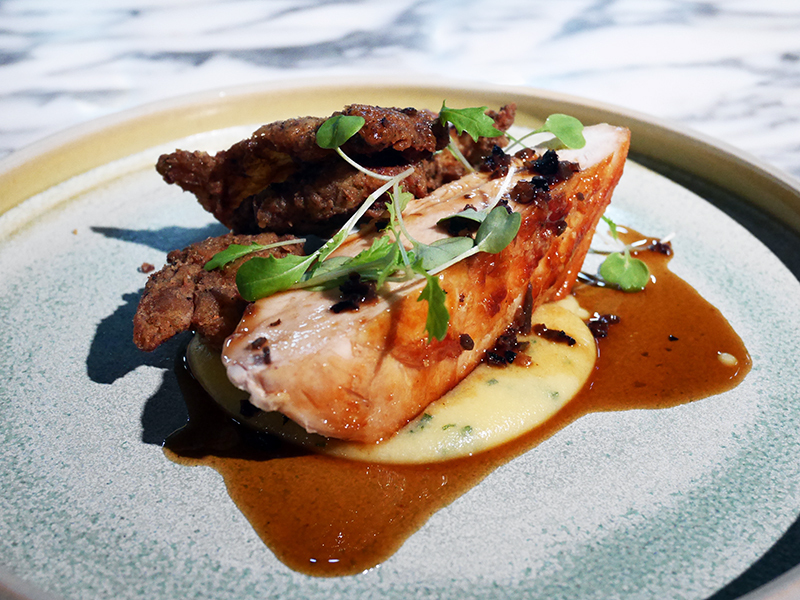 The quality and excitement, thankfully, hasn’t been diluted and save for a few wild cards in there that chef Matt Gillan seems to thrive on, it offers great food with enough twists and surprises to make the meal feel special regardless of what your visit is for. Don’t disregard the “bites”. 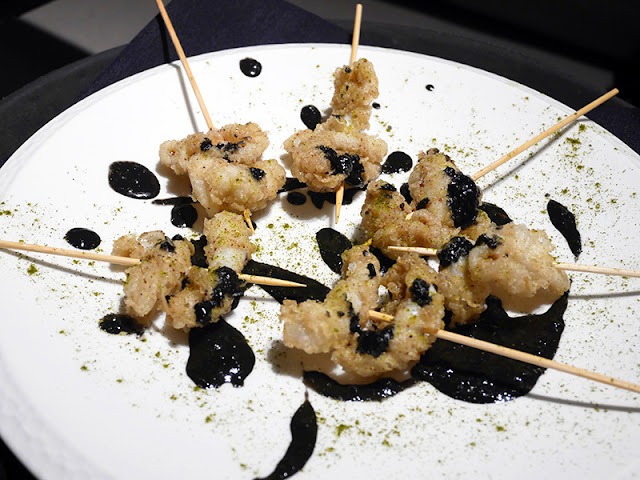 The fried XO squid in a devilishly dramatic black sauce are well worth the order and dare I say it, arancini better than any Neapolitan versions I’ve had, soft as a luxury down duvet and topped with fried capers to wake up those taste buds. The sharing plates were a mixed bag for me. 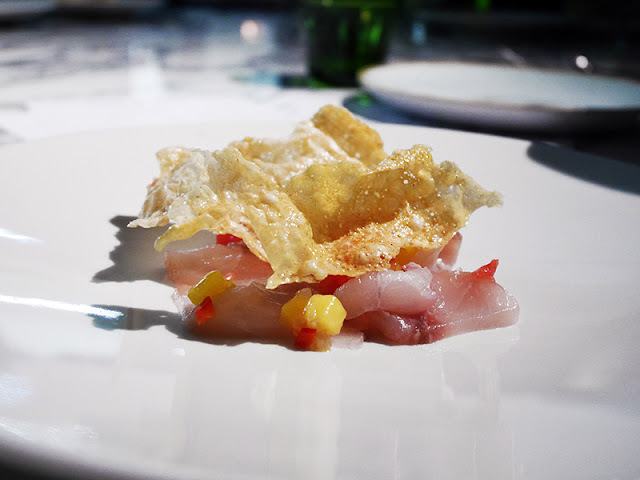 Stone bass ceviche was lively with a chilli and mango salsa, although technically it was sashimi, having not been cured in any citrus. 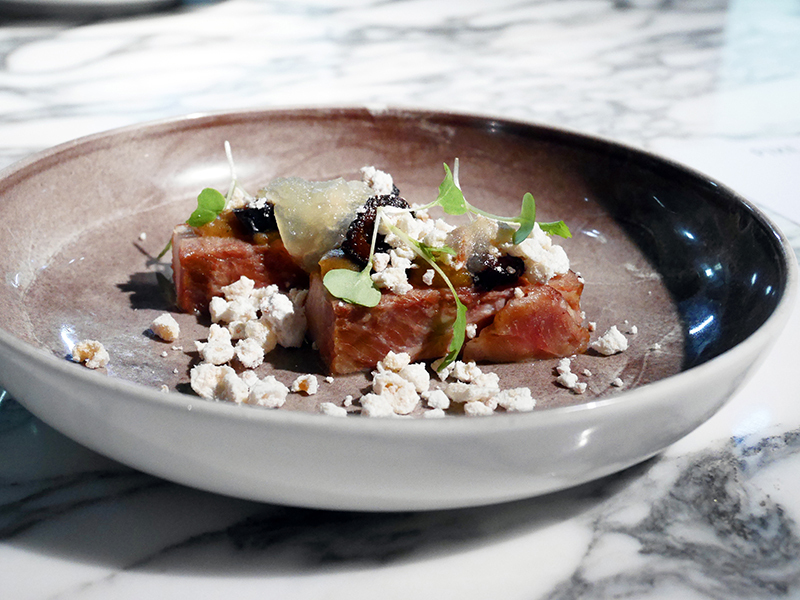 Pork belly sure looked the part and the jammy dehydrated prunes, apple puree and pork scratching powder were perfect with it, but I would have loved the pork belly itself to be rendered more to meltingly tender. A namesake Pike & Pine dish, served in a little bowl that only particularly intimate people could share, was a clever nod to the daytime business - a silky coffee espuma, mushroom puree, truffle and confit egg and a Parmesan crisp. Completely twisting my melons though were the picked blueberries - too much of a departure from the earthiness of the rest of the dish for me. On to mains and who doesn’t love the comfort of poached and roast chicken? And served with some of my favourite things; wet potent and truffle. The battered leg pieces were also delicious - something that would work well on the daytime menu with the oyster sauce alone. 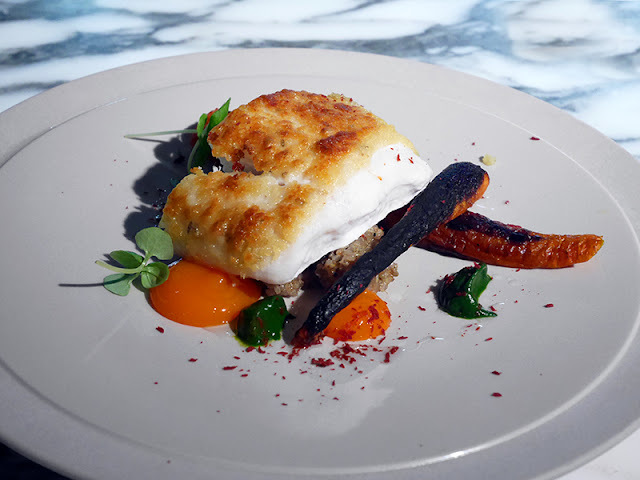 Just as good was a hunk of halibut, topped with a fennel crust to enhance the sweetness of the fish, served with charred sand carrots (no idea either, but I liked them) and vibrant purees of carrot and basil, this dish was harmonious and nutritious with spiced quinoa. Desserts particularly shone and were visual masterpieces. 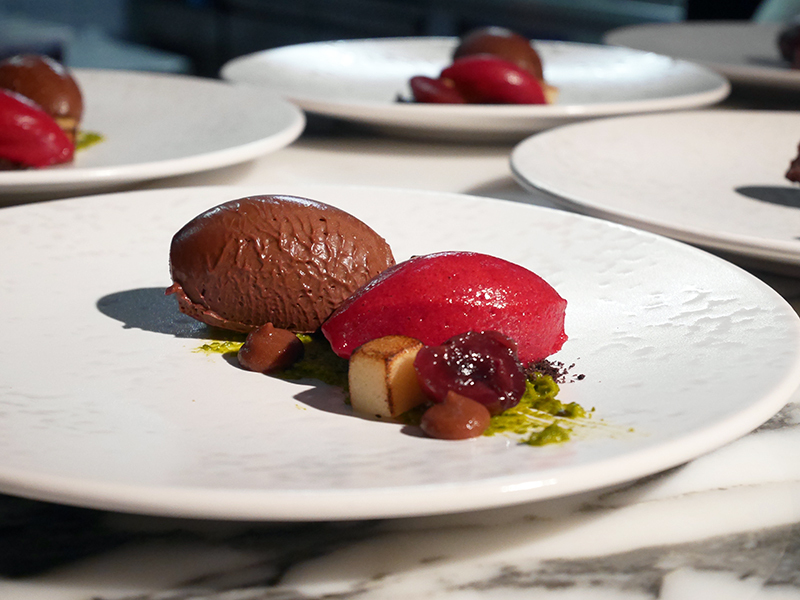 Normally I’m no fan of chocolate desserts, but the smooth 63% cremeux with cherry sorbet, marzipan and pistachio paste almost turned me. Almost. However the lemon and matcha dish was very much my type on paper and plate; fresh, lively and with the right amount of quirk. 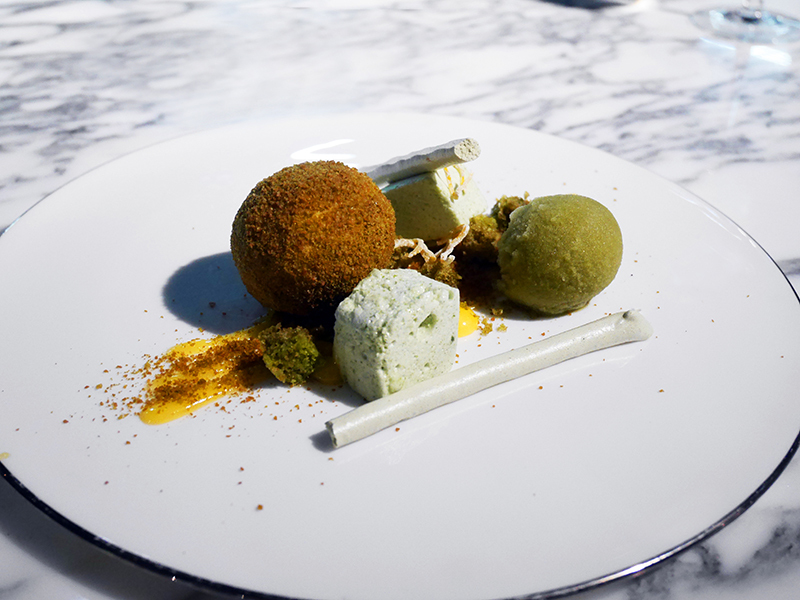 A ball of lemon cheesecake, matcha meringue and sticks, green tea sorbet, croutons and a lemon curd that brought all of the guns. Perfect. 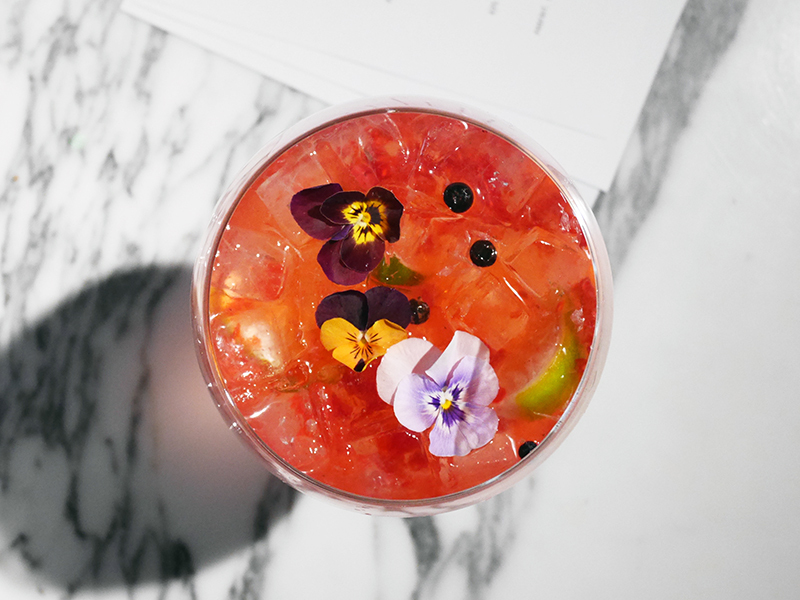 My drinks writer friend always laments about booze being seen as the poorer sister in a lot of restaurants but here they have been given the attention they deserve. The wine lists are really carefully crafted and cocktails well balanced, unique and worth popping in for alone. I see from social media that this menu is already being tweaked - perils of attending launches of any kind I suppose, but I’m sure its evolution will still be one of Brighton's most interesting dining options. It's a great move for Pike & Pine and seems a better fit for the environment too. The daytime menu for Red Roaster will also be revamped with a nod to both healthy eating and indulgence which I'm eagerly anticipating - the cafe remains one of my favourite spots to work and brunch from. Dining events are also still on the cards which is good news. I still think about (and probably talk too much about) the Ridgeview dinner hosted in early September. It was a triumph for food and one of Sussex’s best drinks producers. Next one up will be with renowned chef Brad Kilgore from Miami-based Alter in November. Well work a look up. 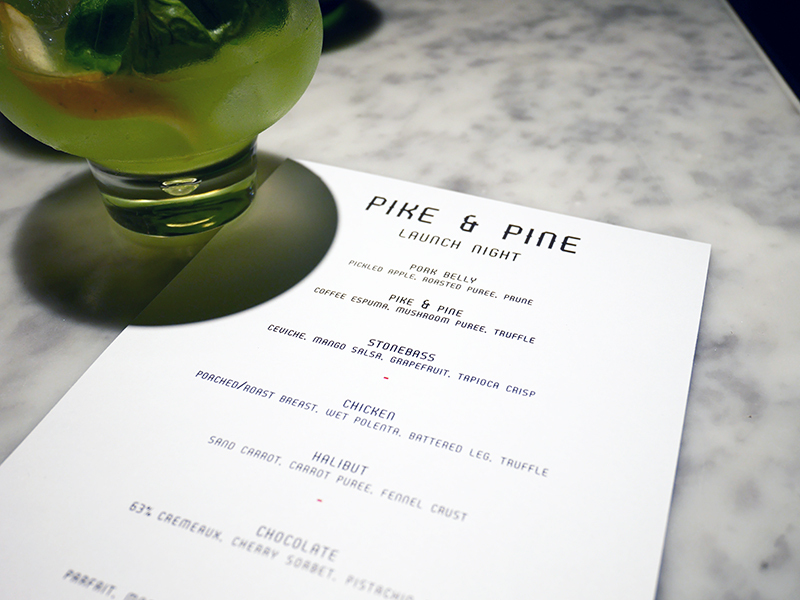 I dined as a guest of Pike & Pine. Words and thoughts, as always, my own.